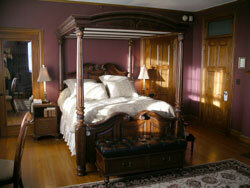 Skiing in Vermont, sleeping in a Castle! I was born in the wrong era, I think as we drive up to the century old stone Castle perched on a hillside in Vermont. I can imagine arriving by horse drawn carriage under the Porte Cochère of this grand mansion. Well, we may be a century late, but discovering this 1905 Castle is a timeless treat. 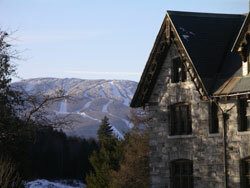 We had passed The Castle on previous ski trips to Okemo Mountain in central Vermont. I had admired the twinkling lights from each window that lit up the elaborate stone architecture, but I could only dream what grandeur lies within. The magnificent grey stone palace looked like the private hideaway for some well to do magnates, presumably too posh for a ski weekend at Okemo. When we learned that The Castle offers winter ski and stay lodging packages, we eagerly added our names to the historical guest list and ventured within the Castle doors. 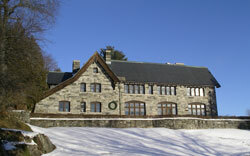 The Castle was originally built for Vermont’s republican Governor Alan M. Fletcher who served from 1912-1915; construction by European craftsmen spanned five years. If we had been the Governor’s guests in the heyday, we would have joined his notoriously lavish parties, staying in one of the 10 gorgeous upstairs guestrooms for perhaps a month. Instead we were treated like modern royalty for a weekend, beginning with a warm welcome in the grand Foyer. The Castle interior is rich with elegant carved wood paneling, velvet drapes, original furnishings, and ornate plaster ceilings. A handsome Library affords floor to ceiling windows viewing Okemo’s snow-covered trails, where we planned to ski the next day. The original imported wallpaper lines the grand staircase. Suites on the second and third floor of the Castle feature lush canopy beds, deep wingback chairs, and rather splendid bathrooms (two have whirlpool tubs). The 1905 elevator, still in working condition, is evidence that the Governor spared no expense to create the most luxurious country “cottage” for his fortunate friends, this was the first home in Vermont to showcase such modern appliances and fixtures. Of course, had I visited the Castle during those decadent days, downhill skiing would not have been an option, nor the state-of-the-art Aveda Concept Spa, for that matter. The original Carriage House, also on the National Registry, has been thoughtfully transformed into a serene day spa with every treatment imaginable. Within the Victorian Carriage House guests can workout on the finest fitness equipment, be pampered in the beauty salon, or feel kneaded by the expert massage staff. It’s no surprise that The Castle Hill Resort and Spa is an ultimate location for magnificent wedding celebrations. I would preface that by saying the Castle would be a fairy tale setting for the “will you marry me?” moment. How could the princess say no to her prince at the Castle? Our skiers’ breakfast the following morning was absolutely elegant, with candlelight. Served in the original Oval dining room was a beautiful buffet of fresh fruit, homemade granola, white-chocolate cranberry scones and scrumptious just-baked quiche. After a day carving Okemo’s ego-pleasing terrain, we were ready to return to some bubbly time, Champagne after (not before) the outdoor hot tub and heated pool at the Castle Hill Spa. Fellow Castle guests shared with us tales of their day’s adventures in Vermont; cross-country skiing, sleigh rides and even snowmobiling can be arranged locally. A shuttle transports guests from the Castle to the alpine and Nordic skiing at Okemo (3 miles away), or to the delightful downtown of Ludlow for boutique browsing. 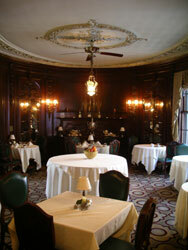 Dinner was “to die for” in the formal mahogany enclave, seated by the toasty fireplace. Four extravagant Chef’s courses were served to us on polished silver, china and crystal. 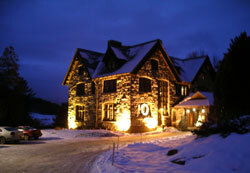 With a prix-fixe menu in the $50 league, the lodging package including dinner offers good value. The tinkling keys, as Tom serenaded at the grand piano, capped off our epicurean evening. Life is good – as you revive a time of castles and no cares. It was difficult to leave this fantastically historic haven, and re-enter the world of high-speed this and worldwide that. Taking comfort that The Castle has been perfectly preserved thus far; we already long for another retreat to this grand Vermont resort. Castle lodging packages include Champagne and Belgium chocolates in your room, a four-course dinner and breakfast at the Castle, and use of the Spa facilities, prices start at $159 per person, double occupancy for two nights midweek this winter. Modern real estate in the way of condominiums have been added to the Castle Hill property; Resort Homes dot the hillside behind the stone centerpiece building. These new townhouses are graciously decked out inside, and spacious for families. Guests and owners of these Resort Homes have access to the Spa and the Castle dining. On our return trip to Maine, we enjoyed more pleasant ski turns at Mount Sunapee in New Hampshire, Okemo Mountain Resort’s sister resort, and a welcome opportunity to burn off the weekend’s gourmet indulgence. If you are in search of a stately stay in the Green Mountains, or looking for the perfect place to pop the question this Valentine’s, treat yourself to a trip back in time to The Castle. See more Romantic Vermont Ski Destinations.